Kings Point in Delray Beach, Florida is a resort-style community for those 55 and better. The three clubhouses in the community house all of the amenities ensuring residents always have options to stay socially and physically active. Built between 1973 and 1985, this 55+ community consists of 7,200 condominium units available on a resale-only basis. Active adults love these condos for their low-maintenance lifestyle. Residents do not have to travel too far for daily conveniences as the community is surrounded by numerous options for grocery stores, shopping malls, and medical services. Residents of this community in Delray Beach enjoy a myriad of resort-style amenities. There are three clubhouses in the community open to all residents. The main clubhouse is located off of Tuscany Drive. Here, residents can work out in the state-of-the-art fitness center, enjoy a show at the performance theater, or join in a game of poker in the card room. The amenities continue outside with two outdoor pools, two tennis courts and 28 shuffleboard courts. There is also an 18-hole par-3 golf course offering great play for those just getting into the game or advanced golfers looking to shape up their short game. The Flanders Clubhouse is another clubhouse located just off Flanders Way. Here, residents can play a game of billiards, meet for a club in the multi-purpose room, or take a dip in the outdoor pool and spa. There are also four tennis courts, and six shuffleboard courts. Golfers with a little more skill can enjoy the executive 18-hole golf course that starts just outside this clubhouse. The Monaco Clubhouse is the smallest of the three clubhouses in Kings Point. Homeowners can utilize the fitness room, play some billiards with a friend or join a game of bridge in the card room. This clubhouse also offers outdoor amenities with an outdoor pool and spa, two tennis courts, and two shuffleboard courts. With three clubhouses in the community, residents always have great options for entertainment or recreation. Kings Point in Delray Beach was built between 1973 and 1985, offering 7,200 condominium units available on a resale basis. Units in the community range from approximately 762 to 1,100 square feet of living space. Most units offer one to two bedrooms, one to two bathrooms and assigned lot parking. Units come in one or two-story buildings and many have great golf course or scenic water views. These models offer open floor plans and low-maintenance exteriors perfect for active adults. Homeowners in Kings Point in Delray Beach enjoy a great low-maintenance lifestyle. Each resident pays an annual homeowners' association fee that covers general upkeep of the community grounds and amenities as well as exterior building maintenance of the condo units. This lifestyle allows residents to forget about such tedious tasks and focus on spending time with family and enjoying their hobbies. Those looking to join a club will love the endless number of clubs and activities offered to residents. Everything from card clubs, book clubs, glee club and knitting club is offered. Those looking for some friendly competition will enjoy the billiards club, tennis club, shuffleboard clubs and golf club. Numerous shows come to this community to perform in the main clubhouse theater and there are also frequent community parties in the ballroom. With so much to choose from there is sure to be something for everyone at this active adult community. Located in Delray Beach, Florida Kings Point is surrounded by great entertainment and recreation options. Situated just a few miles from the Atlantic coastline residents often plan trips to local beaches up and down the coast. With a close proximity to Florida's Turnpike, those looking to travel to other parts of Florida can do so easily. Surrounded by daily conveniences residents never have to travel too far for some milk or to fill a prescription. With so much going on inside Kings Point as well as the surrounding area, it's no wonder this 55+ community draws active adults from across the country. The main clubhouse in Kings Point offers 100,000 square feet of amenities to keep residents socially and physically active. Main Clubhouse - 100,000 Sq. Ft. The Flanders Clubhouse is a secondary clubhouse just off Flanders Way. All residents of Kings Point have access to this clubhouse. The Monaco Clubhouse is another clubhouse located on Monaco Boulevard. All residents of Kings Point have access to this clubhouse. There are plenty of activities available in Kings Point in Delray Beach. Here is a sample of some of the clubs, activities and classes offered here. Units in the community range from approximately 762 to 1,100 square feet of living space. Most units offer one to two bedrooms, one to two bathrooms and assigned lot parking. Units come in one or two-story buildings and many have great golf course or scenic water views. These models offer open floor plans and low-maintenance exteriors perfect for active adults. I sold my home in Arizona and moved to a villa in Kings Point as a widow. Later I met my husband and we both live in this lovely villa with two bathrooms and we don't have to take care of any landscaping. We are happy here and recommend Kings Point highly. 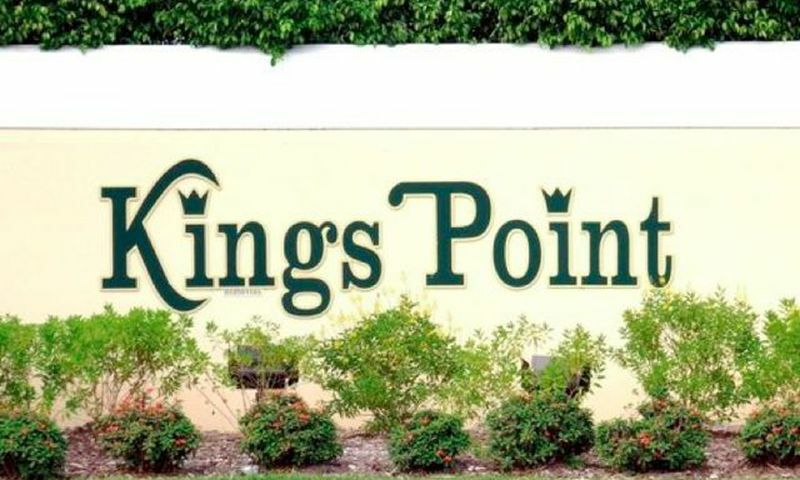 Kings Point is a true value among 55+ communities in Florida, and throughout the U.S. You can buy a 2-bed, 2-bed condo with separate included laundry room for washer and dryer from $65,000 to a bit over $100,000, and less for 1-bed, 1.5 bath units (early 2017). Many original buyers from the late 70's and early 80's have or are aging out. The average age is likely between 75 and 80, but living at Kings Point allows you to be as involved or uninvolved as you want. It's basically like living in any very quiet condo community, yet with as much opportunity as you want for swimming, golf, inexpensive live shows and recent movies, as well as scores of clubs to cover almost any. Two on-site restaurants. Superb location in west Delray between I-95 and Florida's Turnpike. 12-15 minute drive to charming, trendy downtown Delray Beach and the Atlantic Ocean. Lots of good shopping and large medical center nearby. 24-gated, manned security. All exterior condo maintenance and landscaping included in HOA dues, as well as free continuous bus service to nearby shopping, medical center and Boynton Beach Mall and Boca Town Center Mall. 55places.com is not affiliated with the developer(s) or homeowners association of Kings Point in Delray Beach. The information you submit is distributed to a 55places.com Partner Agent, who is a licensed real estate agent. The information regarding Kings Point in Delray Beach has not been verified or approved by the developer or homeowners association. Please verify all information prior to purchasing. 55places.com is not responsible for any errors regarding the information displayed on this website.